We are grateful for the support of the City of Victoria, the Victoria Fire Department and our community. Most of the Following Events will be held in conjunction with the Fire Department. 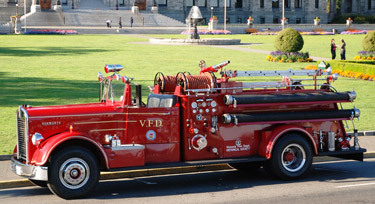 When Available, both Historical and Active Equipment will be used in cooperation with the Fire Chief and the City of Victoria whom we represent. Santa Claus Parade, Government St.
Times will be determined as we prepare for each event. The above list is Tentative and subject to change by reason of additions, cancellations, availability and or weather.